Duffy was born at a very early age among the clatter of horse hooves in the Clydesdale barns behind a large mid western brewery. At age 3 weeks, to the dismay and embarrassment of his parents, , he shunned mother’s milk in favor of pineapple-mango-lemon-lime-pumpkin curry juice boxes, having learned to feed himself by holding the boxes between his left earlobe and right big toe. He mastered juggling twelve sharpened juice box straws by age 3, ignoring multiple facial lacerations while learning. Grease paint seemed to be the appropriate cover up… ergo…clowning! With his highly developed skills in distraction and slight of hand, Duffy faked his way through high school, a college degree, spending several years as an officer in the U.S. Air Force and eventually winding up as an executive in the aerospace industry. He serves as the Director of Entertainment for Komedyplast, one of CCI’s Key Partners, and is a member of the Komedyplast Board. He has authored several small books (none of which are of note, obviously), and is a volunteer disaster action team responder for the American Red Cross. Duffy and his wife of forty years are the proud parents of two children who are recognizable by their ability to speak fluent Clydesdale and juggle juice box straws, simultaneously – upping their dad in the process. Duffy has been a volunteer clown since the invention of sand dunes. Gaston Peter-Contesse (“Peter” to those who don’t know him) was born in Switzerland, raised in a suburb of Seattle, Washington and was well on his way to a degree in Animal Psychology when reality reared its ugly head and gently suggested he try a more practical career. 180 degrees later, he found himself with a CPA and an MBA. Gaston has spent the majority of his career doing accounting, finance and operations in the health care industry. He and his wife, Lynn, enjoy running, hiking, birding and traveling. Gaston and Lynn have been married for 7 years and are parents to 5 adult children and one granddaughter. They are volunteer ski patrollers (winter), volunteer backcountry rangers (summer) and help out with various community activities throughout the year. Gaston’s favorite clowns are Bozo and Pennywise. Laurie “Rose the Clown” Brammer has been clowning since 2009, having graduated from Clown School in Milwaukee, Wisconsin. Her clown name “Rose” is a living legacy to her grandma Rosella who embraced all of the characteristics of a clown – caring, giving, and loving. Rose spent 30 plus years in creative services working as an executive at advertising agencies and in marketing at large regional banks involved in creative development of TV spots, radio, customer communications, print ads, sponsorships and branding. Clowning is another expression of Rose’s love of creativity. As a good clown friend said, clowning is a sacred vocation, a vocation that has proven to bring great joy. Rose and “Mr. Rose” met while both were stationed in the U.S. Air Force in California. Little did he know 40 years ago that he would be married to a clown. Since retiring in 2011, Rose and Mr. Rose have been traveling the world as in-home pet and house sitters. In exchange for free accommodations, they care for people’s homes and their pets for free. Rose has combined pet sitting during these domestic and international house sits with clowning. She has clowned at a theatre group for adults with disabilities during a pet sit in London, at public schools during a sit in Anguilla, and at pet/house sits in Hilton Head, Pasadena, New Mexico, Florida, and Arizona. It’s a wonderful opportunity to become involved in the local community during our extended house/pet sits. Steve was born on a farm in upstate New York to a large family. Fortunately for Steve, his family left farming when he was very young and he knows nothing about farming except that he likes to eat. Steve pursued a career in Electrical Engineering where he moved to California and developed defense based systems for an aerospace company. In California he met his beautiful wife and they have been married for over 26 years. Steve spent several years in Australia while on a “1 year assignment” for his company. While in Australia, we had two amazing children. The kids remember little of the country they were born in except that the people are wonderful and you need to stay away from the spiders and snakes as many are poisonous. We eventually returned to the United States to the great state of Washington where we currently reside and are loyal Seahawk fans. Steve wound up in executive management leading a number of large aerospace programs. Steve enjoys camping, tennis and skiing all of which he’s not very good at. He is committed to helping kids but how he ended up with a bunch of clowns is curious to say the least. Lois: Is happily married over 50 years to high school sweetheart Bob, and is proud “Mom” to three amazing adults. She Is a retired manager for The Boeing Co.
CoCo: Was created in 1998 as Tootie, and re-created as CoCo in 2001, when she returned from her second outreach project in Vietnam, and collaboratively founded CCI. Thus, the beginning of CoCo’s personal mission to “Embrace The Children”. CoCo has entertained children in 40 countries, leaving behind colorful painted faces, big red noses, and an absurd amount of twisted balloons. She tells us that sharing moments of unabashed laughter and joy nourishes her passion for people of all ages! Becoming “Sparkles”, a name chosen by my then 5 year old granddaughter, was natural. My 3 sons always thought of me as a “clown”, I’m sure they meant that lovingly, now they just smile and shake their heads when I put on my costume! 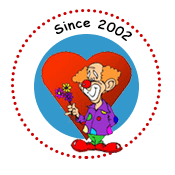 When I started clown class, I didn’t tell my sons/daughter-in-laws what I was doing, I did tell my 7 grandchildren. What fun when I showed up at their houses as “Sparkles”, the kids thought it was great the adults were surprised! Fun to have secrets with grandkids! I was raised to “give” to others, maybe that is why I was a teacher and later retired as a High School Counselor. In retirement I have owned an antique store in Port Gamble and now buy and sell antiques out of two stores and with private clients, not owning a store allows more time to clown around with my grandkids and with other kids. One of the highlights of my life was the trip to Peru clowning. I know I have been blessed, Sparkles has been an extra gift.